Perfectly groomed in a custom sheath dress with a leaf print chiffon bodice by Jason Wu. The occasion? 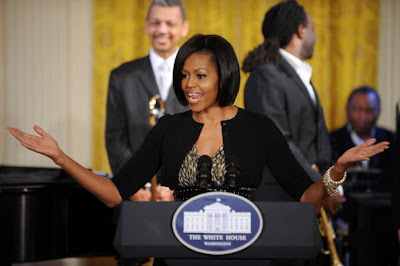 Music preview hosted by the First Lady for the upcoming Governor's ball featuring Grammy-winner composer and singer Harry Connick Jr., at the White House. Photo credits: Getty Images This look is beautiful. 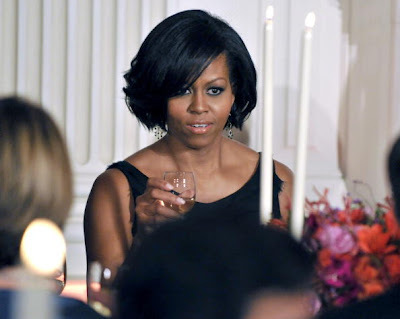 We are loving every little bit of it: from Mrs. Obama's hair, makeup and jewelry to the black tiered ruffled Thakoon gown she wore. She brought pure glamour to the Governor's Ball. 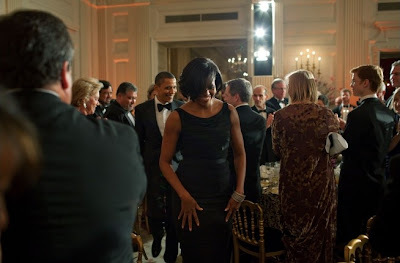 Photo credits: Getty Images Photo credits: Pete Souza/White House. Love, Kelie.